Who doesn’t love a good treasure hunt and adventure? Chandrasekhar Yeleti and the team who made Sahasam, that’s who! Well, at least they certainly haven’t made such a film so I have to wonder. Loosely drawing inspiration from Hollywood blockbusters like the Indiana Jones franchise and Telugu forebears such as Mosagallaku Mosagadu, this had the potential to be a highly entertaining tale. I expected better from the director of one of my favourites, Anukokunda Oka Roju. The story centres on a simple and superstitious man who dreams of great wealth. When he finds his grandfather’s old papers he realises there may be a hidden family treasure. Unfortunately for Goutham (Gopichand) the treasure is stashed near his ancestral home in what is now Pakistan (shown in a flashback with Suman as the grandfather). And Pakistan, according to this film, is populated exclusively by terrorists. Even good characters think nothing of abducting people at gunpoint. Goutham crosses paths with Sreenidhi (Taapsee), a religious girl who is organising a pilgrimage to – guess where. He inveigles his way on to the trip and off they go. The second half of the film is the treasure hunt as Goutham tries to find the diamonds before Sultan (an, er, unbridled Shakti Kapoor) and his sidekick Dilawar (Raj Singh Arora) can get their hands on the loot. Gopichand has the requisite skillset for a Telugu film hero, but the material here is thin at best. The first hour or so is spent proving that Goutham is a bit dim and quite unlucky. You would only need so long to understand that if you were dumber than Goutham. The fight scenes are very athletic (the fake blood budget was fully utilised in many, many dismemberments) and Gopichand was clearly in his element in the thick of the action. Post interval Goutham becomes something of a puzzle solving killing machine with photographic recall which was moderately more entertaining. Goutham’s catchphrase is that he won’t take anything that isn’t his, but if it is his he will never give it up. And that sums him up as a dogged, dour hero rather than a swashbuckling one. As Goutham wasn’t motivated by the usual romantic notions, Taapsee had even less to do than might be expected from the heroine. I find her appeal inexplicable so that was an excellent result. She does use both her facial expressions (grimacing and simpering) so I suppose that is something of an achievement. To be fair, her big moment was as a goat substitute in a game of buzkashi so there wasn’t a lot of nuance for her to convey. Zara, an ally in Pakistan, was much more effective as a character and her performance was more appealing. 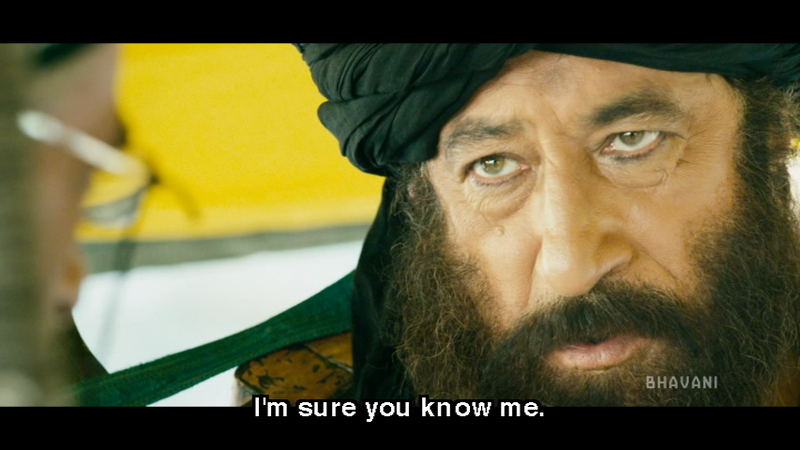 Ali’s character was supposed to be an Indian security expert living in Pakistan but he gave his usual shtick and Qayamat Raju was just an annoyance. Shakti Kapoor is insanely over the top and while I enjoy a properly nasty villain as much as the next person, he spiralled from cunning and ruthless to stupidly petulant and cowardly and finally outright buffoonery. I would not have bet on seeing a worse actor than Abhimanyu Singh in my lifetime but a new contender has emerged in Raj Singh Arora. His idea of intensity is pursed lips and bug eyed staring which has an unfortunately comedic effect when his glued on beard is taken into account. A villain can be crazy but they have to be a credible threat and imbue the dynamic with some menace. Otherwise they are just a jumped up comedy uncle. If I may name drop, earlier this week I attended a masterclass by the amazing Suhasini. Among other things, she spoke about the difficulty of capturing the expression and spontaneity of the live scene when dubbing dialogues. 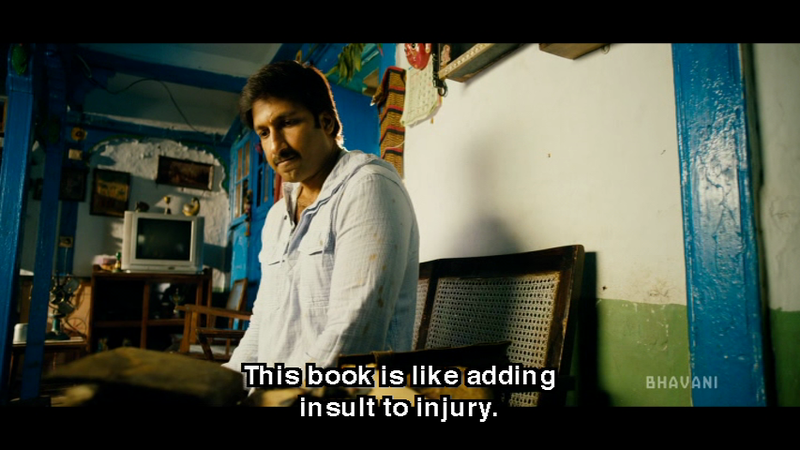 The sound team in Sahasam decided to get around this by ignoring such details. At one point the dubbing is so bad that the screaming goes on long after Gopichand has shut his mouth, and minutes later vigorous fight noises are dubbed over characters who are doing nothing. 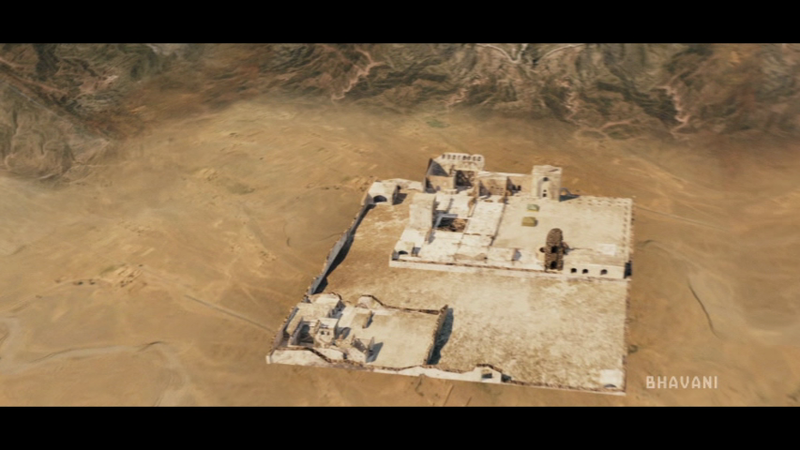 The production design is often excellent, but some clunky CGI does detract from the drama. I liked the scenes set in Goutham’s home as it looked eccentric and colourful but still lived in and real. Ladakh played the role of Pakistan and cinematographer Shyam Dutt used the stunning scenery and harsh light to good effect. Unfortunately Shakti Kapoor and his convoy of thugs are often blocking the view. The ‘olden days’ sequences are blighted by some cheap looking visual effects and inconsistent approach to things like light sources in underground chambers. I found myself being distracted by the similarity of all the spiderwebs in all the caves and wondered if they were bought in bulk. And apparently the ‘terrorists’ use special bullets that can kill a man but not penetrate a car windscreen. Then there are the other special bullets that can destroy masonry but not harm Gopichand. Sigh. There are five writers credited (including Chandrasekhar Yeleti) and I wonder if that contributed to the lack of cohesion in the story. There are several tangents that fail to develop into anything substantial or credible and the mood sometimes changes abruptly. The pacing is never quite right and there is no tension leading up to the final scene despite all the ingredients being present. I read an interview with the director and he mentioned that he felt obliged to change things a bit to suit Gopichand’s image. Perhaps the film would have benefited from some more consideration as to how to incorporate the action hero elements. The songs by Sri are average and not very memorable. The hero introduction has some visual flair but the songs don’t contribute to the story and the picturisations are nothing special. It was like watching two really bad movies rolled into one. Sometimes that results in a guilty pleasure that is So Bad It’s Good. 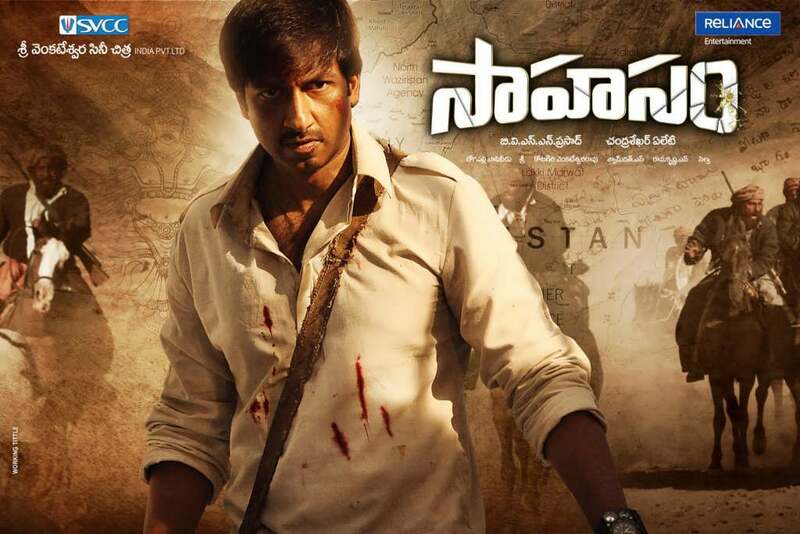 Sahasam is only halfway there if you catch my drift… 2 stars! This entry was posted in Tollywood and tagged Ali, Chandrasekhar Yeleti, Gopichand, Raj Singh Arora, Sahasam, Shakti Kapoor, Shyam Dutt, Sri, Suman, Taapsee, Telugu. Bookmark the permalink.